51 years old Nguyen Quang Ngoc in the Central Highlands province of Dak Lak is a real wizard with more than 20 national and international patents though he has not attended any science course. His first invention, a disposable coffee filter with tablet of coffee, sugar, milk inside, was patented by the Ministry of Science and Technology. The first invention has provided an incentive for him to manufacture other useful machines such as a machine to turn over the soil with geographic vibration, an equipment to keep moisture for tree, and an automatic fertilizer and water sprayer. Amongst them is the machine to turn over the soil with geographic vibration will directly make impact on tree in each growth phase; therefore, it offers relief for growers' labor woes. 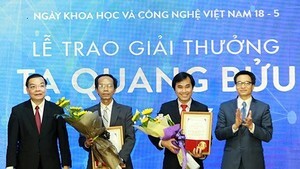 His latest invention, a naturally pure pot for planting, was patented by the National Office of Intellectual Property of Vietnam in 2007 and later by WIPO. He said that he spent five years inventing the planting pot which is adapted from three layers of the amazon rainforest. More importantly, farmers will find ways to save volume of water, human labor and energy. The supporting board is covered with a cloth let down into the bottom of the wet pot. The water is continuously supplied to the earth above, at the same time, thanks to draining holes, air will be continuously supplied to the earth on upper half of the pot, making airy the earth in the pot and then supplied to the plants. Trai Dat ( Earth ) Company has manufactured his planting pot to export to European countries, the US, Australia and Japan. It fetches VND200,00 – VND500,000 ($8.6 - $21.5) each. 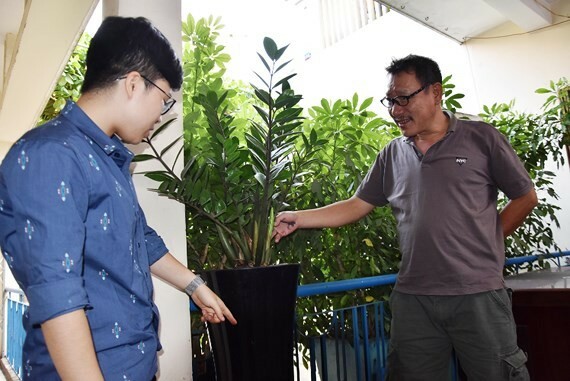 Once the pot is used widely, big cities or large square and streets in downtown will be covered in green, said inventor Ngoc.